Vintage One: 20 years of Mtn Bike passion and counting. : Sometimes you have to follow your heart. The heart is not to be trusted. This must be clearly understood right from the beginning. It is a self serving trickster that is no good compass for steering the ship of your life. But sometimes you just need to follow it anyway, especially if it is not a life shattering decision or anything that will get your name known to the local magistrate. So that is what I did in large part, followed my heart but not without a bit of hard thinking to back me up. I bought a steel framed road bike. Well, a frame at least and the parts to go with it. And I bet in the minds of most bike riders you might talk to, that decision makes no sense at all. The heart said "ohhhh!". But the pocketbook said "whoa!" And then the mind said "go!". Or something in that order. It is all still a bit fuzzy. And now I have this in a box in the dining room. Ain't she a sweetie, though? Why not carbon or aluminum or Ti? Great carbon is amazing. It is the best material there is to make a sporting/performance bike from. But great carbon costs a great deal of money and average carbon is still pretty costly and is not so special. Great aluminum is affordable and is, in my opinion, better all around then average carbon. Ti is the stuff dreams are made of in some ways, but great Ti is big bucks and average Ti is no better or may be worse than great steel. So I had narrowed it down to a very well spec'd alu framed complete bike and was ready to pull the trigger when the bottom dropped out on the supply of that model and things went into limbo for a bit. That gave me time to think and web surf. That is a dangerous combo. 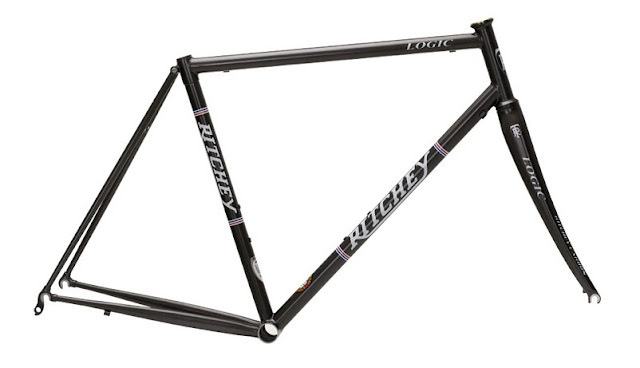 And I began to look at other options and found myself at the Ritcheylogic.com site. And the Logic 2.0 frame set caught my eye. Subtle graphics. Thin tubes. Graceful lines. All carbon fork. And I started day-dreaming about riding it. I had not romanticized about riding the aluminum frame when I was getting ready to buy that. So what gives? I found myself thinking about long rides up the coast in the fog while astride this steel framed assembly of slender tubes and tidy welds. I was pedaling along, mist condensing on my helmet edge, dripping off as I looked down at the svelte, grey top tube. It inspired me. It was not all goose pimples and fluttering heart beats though. It said Ritchey on the side of it and that meant that Tom had his hands elbow deep into the bike's design and construction, even if he did not hold the torch. And that guy is pretty smart. It is a modern take on classic road geometry, at least to my mind. Not a Gran Fondo/Endurance approach, but a classic all-rounder. And since I am just learning here, that seemed like a good place to begin. But it was still a tough decision. It cost me more than the alu bike would and it weighs about a pound and a half more, neither being convincing arguments for buying it. It is out of fashion, but so am I. And I have to admit that I got a certain satisfaction when I thought about riding that steel frame in world full of resin injected, carbon wrapped, moulded machines. Can you imagine the looks from the cycling cognoscenti as I ride past them on the road? Makes me grin just thinking about it. So parts gathering is well in hand and soon the wrenches will be spinning in earnest. Will reality match my heart's desire? We shall see. 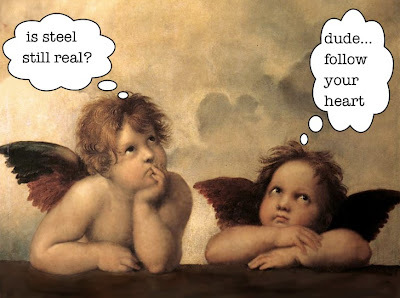 If not, I can always blame Cupid. "Fire and wind come from the sky, from the gods of the sky, but Crom is your god. Crom, and he lives in the earth. Once giants lived in the earth, Conan, and in the darkness of chaos, they fooled Crom, and they took from him the enigma of steel. Crom was angered, and the earth shook, and fire and wind struck down these giants, and they threw their bodies into the waters. But in their rage, the gods forgot the secret of steel and left it on the battlefield, and we who found it. We are just men, not gods, not giants, just men. And the secret of steel has always carried with it a mystery. You must learn its riddle, Conan, you must learn its discipline, for no one, no one in this world can you trust, not men, not women, not beasts... This you can trust." Les vrais hommes montent acier.